• Buckbee has been involved with Huntsville's rocket and space programs for five decades. 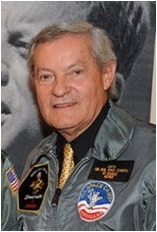 • Buckbee began his space career in 1959 when America's first Mercury astronauts were selected. • Huntsville Times - Buckbee recalls Alan Shepard's historic flight on the 50th anniversary. • Wikipedia: Space Camp - Entry on Space Camp. • You Tube - Buckbee talks about the origin and development of Space Camp.